(Reuters) - An on-air racial quip that landed one of France's best-known political commentators in court has exposed raw differences about what can and cannot be said in public on ethnicity and its role in social problems. Sarkozy has largely failed to lift the taboos on addressing the root causes of alienation and joblessness among France's immigrant youth as he promised to do when elected in 2007, leaving him open to accusations of inaction from all sides. "He could be taken to task on results, which after all is the culture he promoted," said Francois Miquet-Marty, an analyst at the Viavoice polling agency. "In 2005, there were riots in the suburbs, and the situation has not changed much today. You could say that expectations have not been met." That changed when Zemmour, a Frenchman of Algerian Jewish origin, said on a talk show panel that if black and Arab people were stopped by the police more often than other ethnic groups, it was because they were more likely to be "dealers". 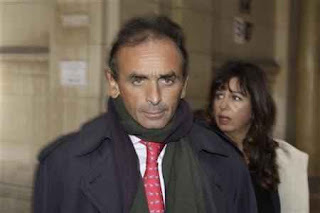 "Eric Zemmour violated a French taboo. There are some questions, including that one, which one is simply not allowed to ask in France," said Frederic Micheau, a researcher at the IFOP polling institute.